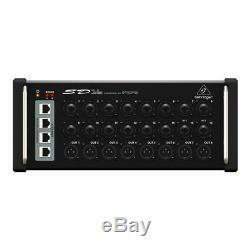 Behringer SD16 I/O Stage Box. 16 Remote-Controllable MIDAS Preamps, 8 Outputs, AES50 Networking and ULTRANET Personal Monitoring Hub. The SD16 is extremely compact and comes with rugged protective bumpers, so you can toss them directly on stage wherever you need them. The best part, all it takes is a single Cat 5e cable per stage box. If you need more inputs, or just want to keep your cable runs short and tidy, putting an SD16 at stage front and another behind the drum riser giving you an additional 16 inputs for drum and guitar/bass amp mic'ing. When used as part of a complete X32 system, as many as three SD16 Stage Boxes can be cascaded via the built-in AES50 ports to provide up to 48 bidirectional inputs and 24 balanced XLR outputs. An onboard Ultranet distribution hub provides power and 16 channels of audio to 4 Behringer Powerplay P16-M personal monitor mixers per SD16, all via inexpensive Cat 5e cabling without any additional hardware. Two of the programmable inputs are also compatible with Hi-Z sources, so you can connect keyboards, acoustic and bass guitars, etc. With no DI box required. The SD16 also features a USB port for fast and easy system updates via your PC. MIDAS - The Legend in Sound Quality Ever since its formation in the 1970s, MIDAS has had a long history of innovation and leadership in the world of audio mixing consoles. Employed by the most famous touring acts and installations world-wide, legendary MIDAS consoles such as the XL4 and Heritage H3000 quickly became industry standards. MIDAS has earned their impeccable reputation due to their no-compromise approach for audio and build quality and in particular for their Award-winning Mic Preamps which are considered by industry experts as the industry's best sounding designs. Building on this legacy, the XL8 and PRO Series of Live Mixing Systems continue this great heritage of Award-winning audio quality. Behringer is proud to incorporate MIDAS designed mic preamps for the ultimate in high-quality audio reproduction in both live and studio environments. Remotely Controllable Preamps Make Setup a Breeze The SD16 Stage Box is a studio/live sound engineer's dream come true. Setup is extremely easy, with virtually all parameter control taking place at the console - including the award-winning MIDAS-designed mic preamps, +48 V phantom power, destination routing, etc. Just put the SD16 where you want it, run a few Cat 5e, mic and instrument cables - and head for the console. The SD16 makes setting the stage up virtually foolproof! 8 Servo-Balanced XLR Outputs The SD16 features 8 XLR balanced outputs, allowing you to connect to your amp racks, active loudspeakers and monitors. Thanks to its reference-class Cirrus Logic 24-bit converters, SD16's digital operation eliminates even the slightest possibility of Radio Frequency Interference (RFI) and crosstalk. You get ultra-pristine audio performance, no matter the application - something unheard of in this class! KLARK TEKNIK AES50 KLARK TEKNIK SuperMAC (AES50-Compliant) technology gives the SD16 its high-capacity, ultra-low latency digital interconnectivity, as well as superbly simple deployment and ease of use. KLARK TEKNIK engineers worked hand-in-hand with BEHRINGER to ensure the SD16 meets, or exceeds, the requirements of live entertainers and their professional audio engineers. Some of the outstanding features are. 48 bidirectional audio channels over Cat 5e cable (48 kHz). 24 bidirectional audio channels over Cat 5e cable (96 kHz). Single cable duplex interconnection for audio and sample clocks. Ethernet physical layer audio data transmission. High channel count and ultra-low deterministic latency. Comprehensive error detection and management. Minimal configuration - total ease of deployment and use. Ethernet TCP/IP protocol-compatible auxiliary data channel. Royalty-free implementations available as Xilinx FPGA cores. OEM modules available from developer partners. ULTRANET - Seamless Integration The world-renowned engineers at KLARK TEKNIK, MIDAS, TURBOSOUND and BEHRINGER have all come together to create something truly innovative that will change your live and studio workflow forever - welcome to ULTRANET. This revolutionary technology seamlessly transmits up to 16 independent channels of 24-bit digital audio and control data via a single Cat 5e cable between compatible digital devices - including mixers, I/O stage boxes, powered loudspeakers and personal monitoring systems. Advantages realized through ULTRANET digital networking, versus traditional analog methods, include: all audio signals are impervious to Radio Frequency Interference (RFI); signal crosstalk is eliminated, and ease of use translates directly into a significant amount of time saved during show setup or installation. And the SD16's onboard ULTRANET distribution hub supplies phantom power over CAT5 directly to your P16-M Personal Monitoring Mixers, eliminating the need for external power adapters. ULTRANET effectuates a powerful digital eco-system that gives you unparalleled ease of deployment, performance and control for BEHRINGER P16 Personal Monitoring Systems and Turbosound iQ Speaker Series. Extreme Value As you can see, the SD16 is an extremely versatile 16 x 8 digital stage box solution with remote-controllable MIDAS-designed mic preamps, KLARK TEKNIK's AES50 connectivity and a wealth of other professional-grade features - all at a price anyone can afford! Built tough enough to withstand the rigors of the road, the SD16 connects to FOH with a single, inexpensive Cat 5e cable. You Are Covered Behringer always strive to provide the best possible Customer Experience. Behringer products are made in their own MUSIC Group factory using state-of-the-art automation, enhanced production workflows and quality assurance labs with the most sophisticated test equipment available in the world. Merchandise and packaging MUST be in the same condition as when received. Alto Music reserves the right to refuse any return if it appears the item has been used. Software (if unsealed or registered). Harmonicas, Mouthpieces, Earbuds/Earphones/Headphones(if unsealed), or any item that may come in contact with the mouth, ears or nose. There are no warranties for the following items. The item "Behringer SD16 I/O Stage Box" is in sale since Wednesday, June 7, 2017. This item is in the category "Musical Instruments & Gear\Pro Audio Equipment\Live & Studio Mixers".